What is the SnuggleSafe heat pad? The unique microwave heat pad, designed especially for use in animals' beds. 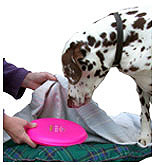 A 210mm round disc (the size of a dinner plate), that fits into any microwave oven and snuggly into any pet's bed. Just pop it into your microwave for a few minutes, it will provide up to 12 hours of warmth. Slip it under your pet's bedding at home, in the car or wherever it's needed. That's it! There is no electric wiring to worry about so there are no nasty shocks in that department. There is no scalding water to spill out. The tough outer casing is bite resistant (extreme chewers please note that it is not chew proof) and hygienically wipe clean. There is no safer way to keep any animal warm and comfortable. Ideal for every animal that needs a heat source. It's ideal during the day either at home or when traveling and it's ideal at night in bed. Cats particularly love it as their favourite warm spot. Not only domestic pet owners use it, Vets, breeders, rescue centres and rehabilitation homes across the world find SnuggleSafe a necessity. Newborn animals, elderly pets and sick animals depend on it. It is even used by farmers to help with newborn animals such as lambs. Specialist animal care centres such as the Battersea Dogs Home in London and the Cat Protection League use SnuggleSafe every day. The graph shows how the heatpad gradually cools during a 12 hour period in a controlled manner. The key to SnuggleSafe's outstanding performance. The Thermapol interior undergoes a physical change of state during the heat cycle. While other conventional bedwarmers would be getting cooler, SnuggleSafe actually self generates extra heat giving an extended warmth unmatched by any other non-electric heater. 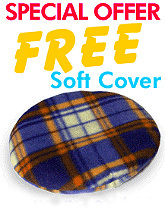 All SnuggleSafe Heat Pads come with a free soft cover!